On the 21st (Wed), make a trip to Tkalciceva, admire the striking features of Cathedral of the Assumption, then stroll the grounds of Mirogoj Cemetery, and finally take a stroll through Upper Town (Gornji Grad). To see photos, more things to do, maps, and other tourist information, read our Zagreb travel itinerary creator. Saskatoon, Canada to Zagreb is an approximately 23.5-hour flight. You'll lose 7 hours traveling from Saskatoon to Zagreb due to the time zone difference. Traveling from Saskatoon in June, things will get a bit warmer in Zagreb: highs are around 30°C and lows about 16°C. 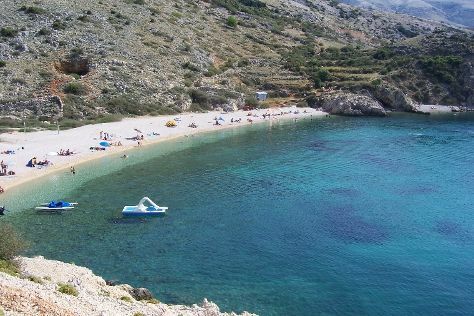 Finish your sightseeing early on the 22nd (Thu) to allow enough time to drive to Krk Island. A trip to Krk Island ensures you enjoy some Italian atmosphere and loads of Croatian culture. Kick off your visit on the 22nd (Thu): take in the architecture and atmosphere at Church of St. Lucy, tour the pleasant surroundings at Stara Baska (Old Baska), then pause for some serene contemplation at Church of St.Trinity - Baska, and finally get to know the fascinating history of Baska. To find traveler tips, photos, maps, and more tourist information, you can read our Krk Island vacation builder. You can drive from Zagreb to Krk Island in 2.5 hours. Alternatively, you can take a bus. Plan for somewhat warmer nights when traveling from Zagreb in June since evenings lows in Krk Island dip to 23°C. Cap off your sightseeing on the 23rd (Fri) early enough to travel to Split. On the 23rd (Fri), steep yourself in history at Kliška tvrđava and then explore the ancient world of Diocletian's Palace. Get ready for a full day of sightseeing on the 24th (Sat): take your sightseeing to a higher altitude at Marjan, then steep yourself in history at Old Split, and then make a trip to The Peristyle of Diocletian's Palace. To find photos, traveler tips, where to stay, and other tourist information, go to the Split vacation builder. Traveling by flight from Krk Island to Split takes 3 hours. Alternatively, you can drive; or take a bus. In June, plan for daily highs up to 32°C, and evening lows to 20°C. Finish your sightseeing early on the 25th (Sun) so you can drive to Dubrovnik. Start off your visit on the 25th (Sun): don't miss a visit to Stradun, steep yourself in history at Gradske Zidine, and then paddle through the water with a kayaking and canoeing tour. Get ready for a full day of sightseeing on the 26th (Mon): head off the coast to Island of Lokrum and then appreciate the extensive heritage of Old Town. For photos, ratings, traveler tips, and more tourist information, use the Dubrovnik trip generator. Traveling by car from Split to Dubrovnik takes 3.5 hours. Alternatively, you can take a bus; or ride a ferry. In June in Dubrovnik, expect temperatures between 30°C during the day and 22°C at night. Wrap up your sightseeing by early afternoon on the 27th (Tue) to allow time for travel to Hvar. Start off your visit on the 28th (Wed): explore the historical opulence of Tvrdalj Castle, then get great views at Spanjola, and then stroll through Dubovica. Here are some ideas for day two: contemplate in the serene atmosphere at St. Stephen's Cathedral and then step off the mainland to explore Pakleni Otoci. To see more things to do, photos, where to stay, and more tourist information, read our Hvar travel planner. Ride a ferry from Dubrovnik to Hvar in 4 hours. Alternatively, you can drive. Expect slightly colder weather when traveling from Dubrovnik in June: highs in Hvar hover around 26°C, while lows dip to 22°C. Wrap up your sightseeing on the 29th (Thu) to allow time to travel back home.